Feverfew (Tanacetum parthenium) is a medicinal herb that has multiple pharmacologic properties. This plant is rich parthenolide (PN). Hairy roots (HRs) culture is a valuable biotechnological tool for the production of plant secondary metabolites. Furthermore, application of elicitors is one of the most effective strategies to induce the metabolite biosynthesis. 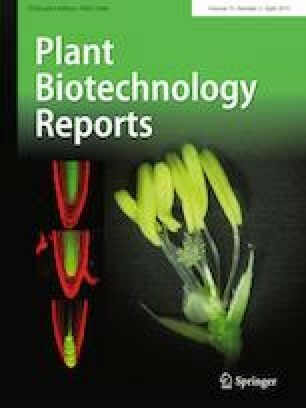 This study has investigated the effects of various elicitors on the production of PN in feverfew hairy root culture and the expression of parthenolide synthase (TpPTS) gene. Three elicitors were used separately and in combination, including yeast extract (YE) (2.5 mgL− 1), methyl jasmonate (MJ) (100 µM), Ag+ (100 µM), YE + MJ, Ag+ + MJ, YE + Ag+, and YE + MJ + Ag+ which were added to the 1/2MS medium on day 18 and after 48 h and 96 h, hairy roots were collected to determine the PN content. Total RNA was extracted from hairy roots and used for cDNA synthesis and real-time PCR analysis to investigate the gene expression of TpPTS. The PN content was determined by HPLC. The highest PN content (0.05 mg g− 1 dry weight) was achieved after application of elicitors (in 2.5 mgL− 1 YE and 100 µM MJ) and the highest expression of TpPTS gene also occurred after 96 h in the same treatment. It was concluded that some of the combined elicitors could efficiently increase the parthenolide content of feverfew in vitro culture. The additive effect of elicitors might be due to the separate mechanisms of each substance that is acting in an independent pathway. HR and AM conceived and designed the research. FP conducted experiments and wrote the manuscript. MK and SM results elaboration and discussion, critical reading of the manuscript. All authors read and approved the manuscript.